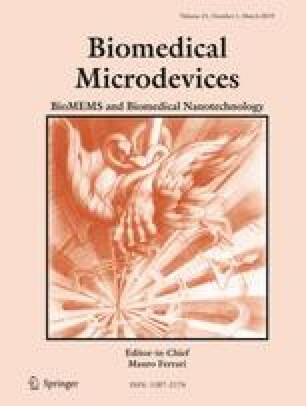 Porous microneedles (MNs) are expected to be applied for diagnostic microfluidic devices such as blood glucose monitoring as they enable a pain-free penetration of human skin and the extraction of interstitial fluids. However, conventional microfluidic systems require additional steps to separate the liquid from a porous structure used for fluid extraction. In this study, we developed a microfluidic system with a hydrodynamically designed interface between a porous MN array and microchannels to enable a direct analysis of liquids extracted by the porous MN array. The microfluidic chip with an interface for the MN array was successfully realized by standard MEMS processes, enabling a liquid flow through the whole microfluidic structure. The porous MN array was fabricated by the salt leaching and molding method, which was integrated with the chip and demonstrated the successful extraction of liquids from an agarose gel-based skin phantom. This work was supported by the Cluster of Excellence BrainLinks-BrainTools through the German Research Foundation (DFG) under Grant EXC 1086 and the DFG project Phytochromes under Grant RU 869/5-1.